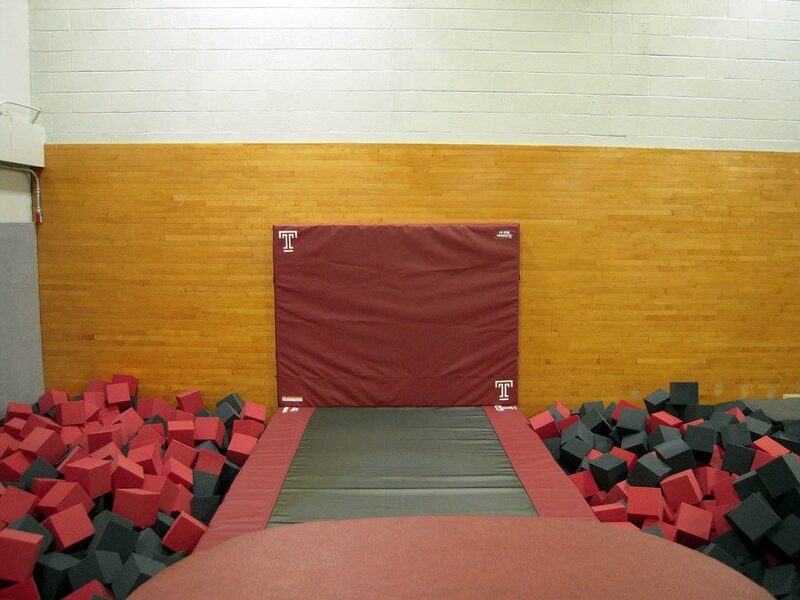 In 2015, the Temple University Women’s Gymnastics team contracted US Gym Products to complete a new gym design, taking their program to a whole new level. When Temple hired their new head coach Umme Salim-Beasley, she took the program in a new direction and brought along a new training facility. Previously, the women’s team had to share a space with both the men’s team and recreation gymnastics program. 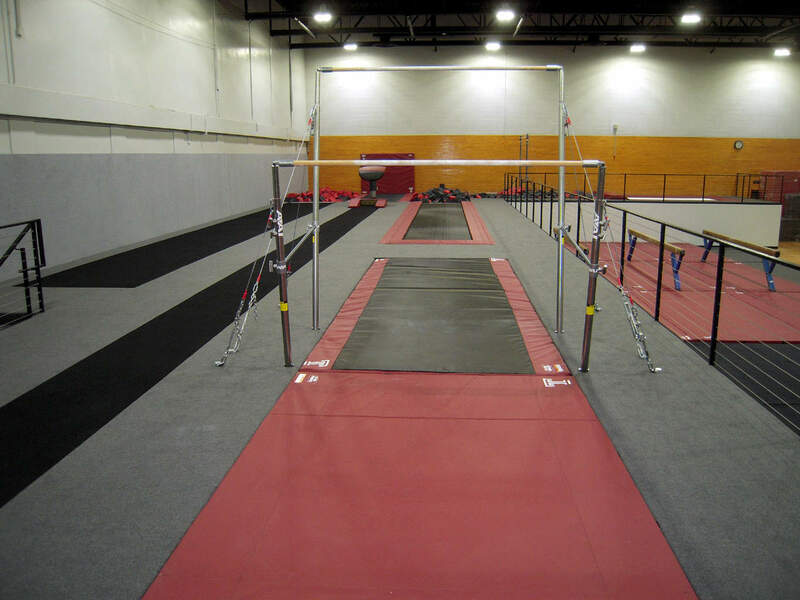 Using older matting/equipment in a space not well designed for gymnastics, the facility did not meet the needs of the team. 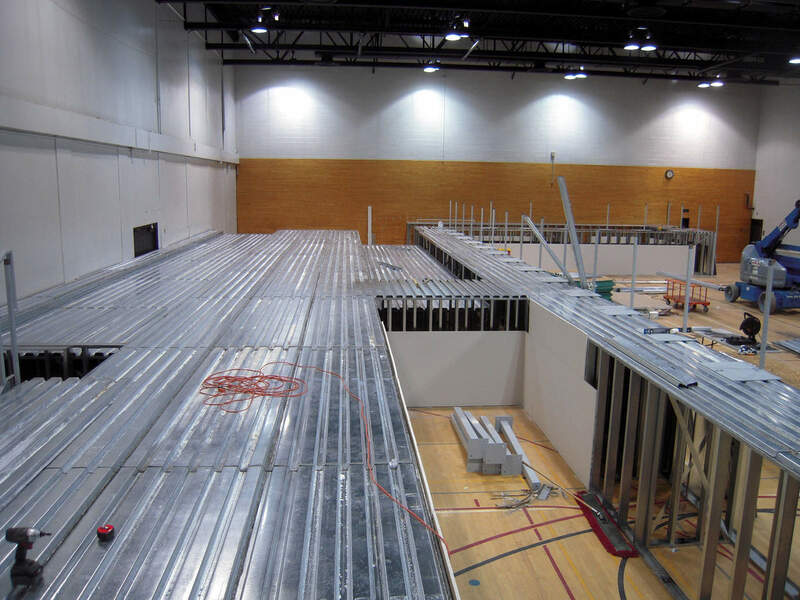 US Gym Products was to design a new training facility for the women’s team within an existing basketball gym. After reviewing the budget and space available (8550 sq.ft. ), we selected a partial platform design that encompassed 3052 sq.ft. – 7x14 Ross trampoline into deep foam pit. This platform stands out because of the completely flush mounted training area which features a 100% padded training surface. Initial construction started Sept 1, 2015 with the steel structure of the platform. 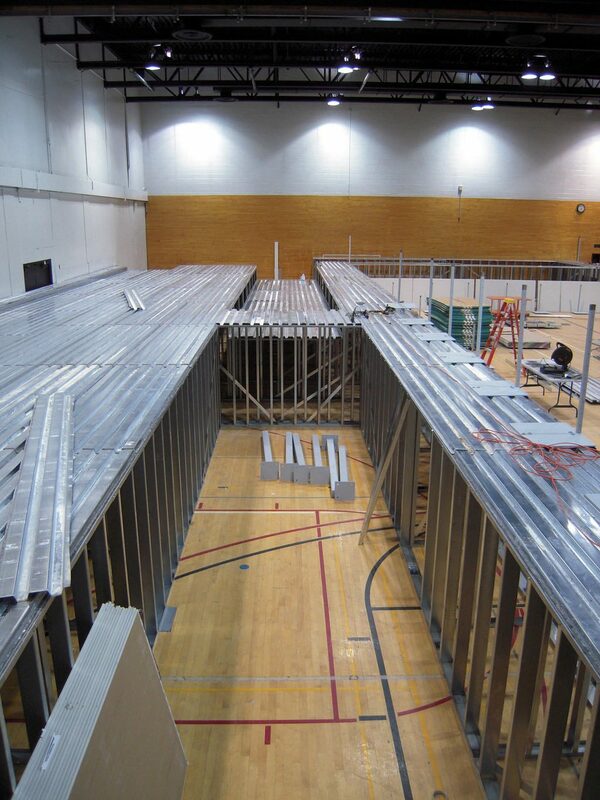 The structure is composed of a structural grade 2x4 and 2x6 steel track and purlin system covered in B-deck. 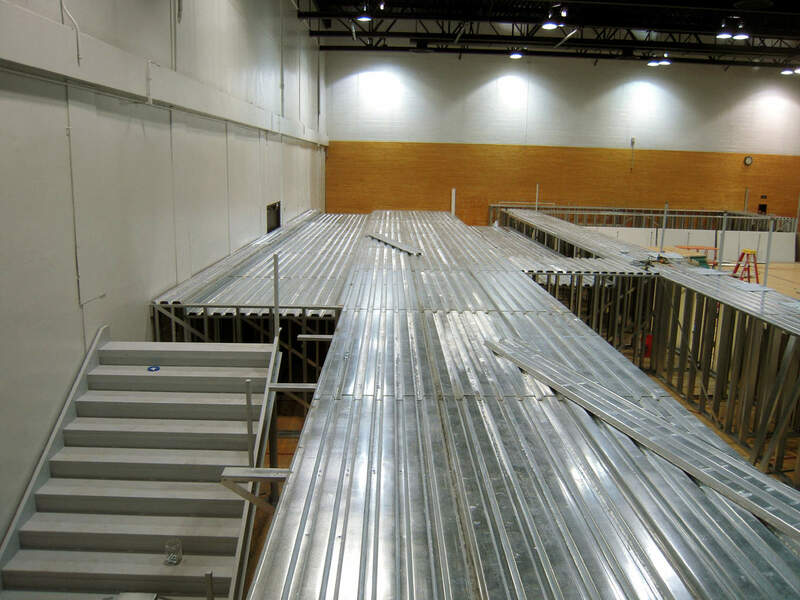 The staircase is 6′ wide and made from structural steel components. The left picture is from the recess for the tumbling strip looking back towards the staircase. It shows the recesses for both the Tumbl Trak and the uneven bars on the left side. The right picture is next to the uneven bar pit looking towards the main pit. Around the back side of the platform are the stairs leading up to top of the platform. 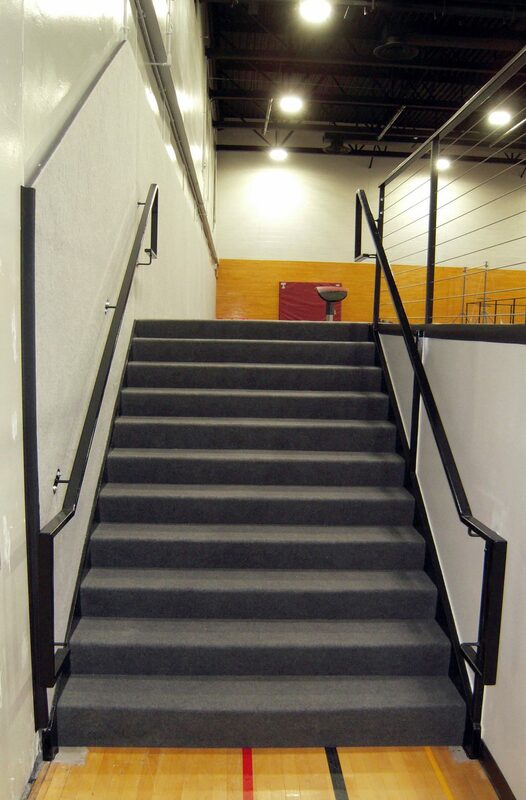 We padded every step with custom cut carpet bonded foam. 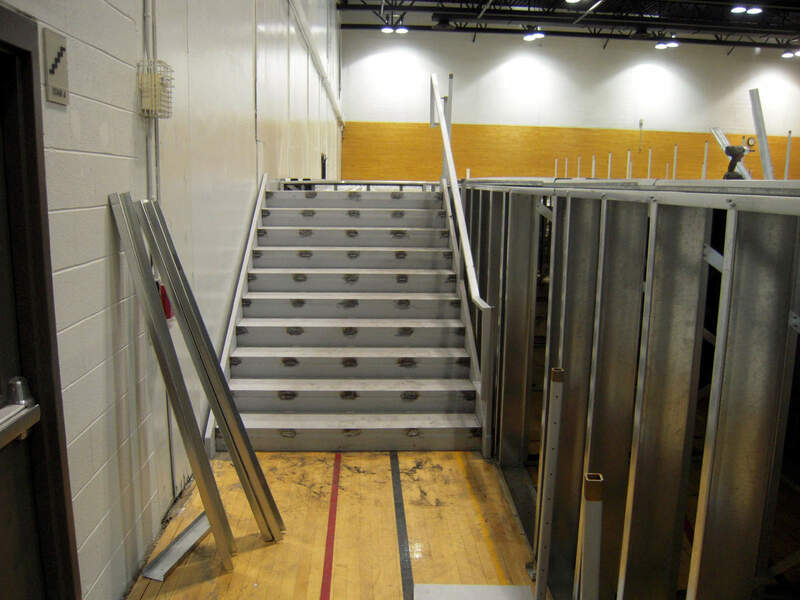 This makes the steel stairs soft for the bare footed athletes to go up and down safely. 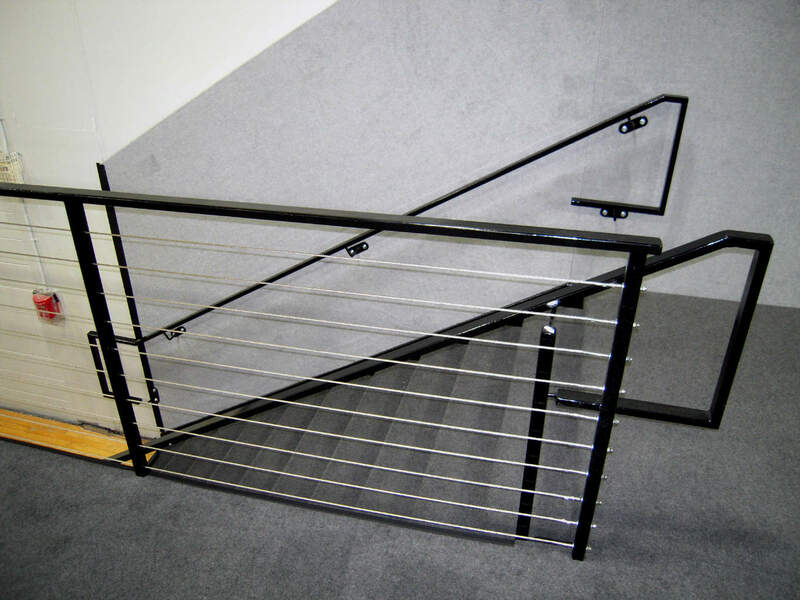 We padded one side of the staircase with carpet bonded foam and utilized stainless steel cable railings. This allows for a clean line of site both on and off the platform and a very unique modern look for the platform. The completed structure compared to the raw steel is simply amazing. The left picture shows the steel and the right shows the finished platform. We covered the entire top of the platform in 1-3/8″ carpet bonded foam. 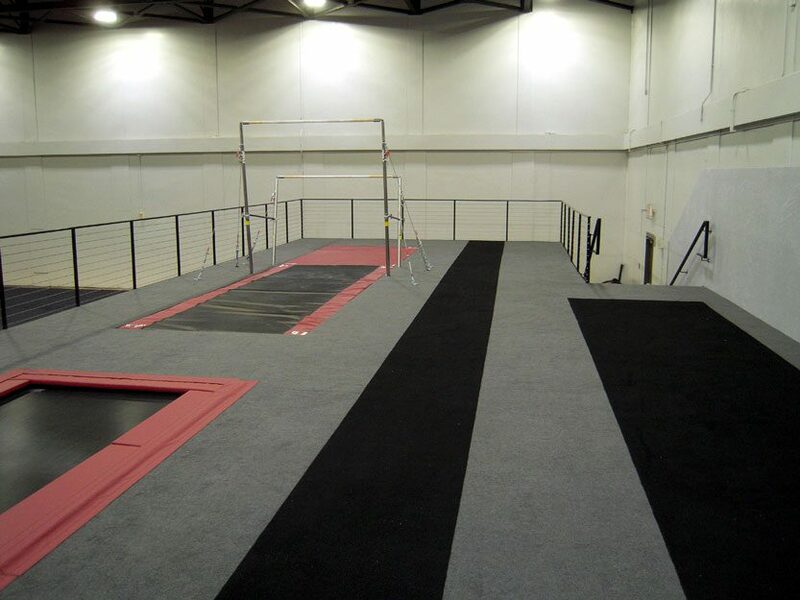 The black tumbling strip and vault runways really stand out against the charcoal, making a clean and easy to see training area. Directly in front of the stairs is the 55’ tumbling strip. 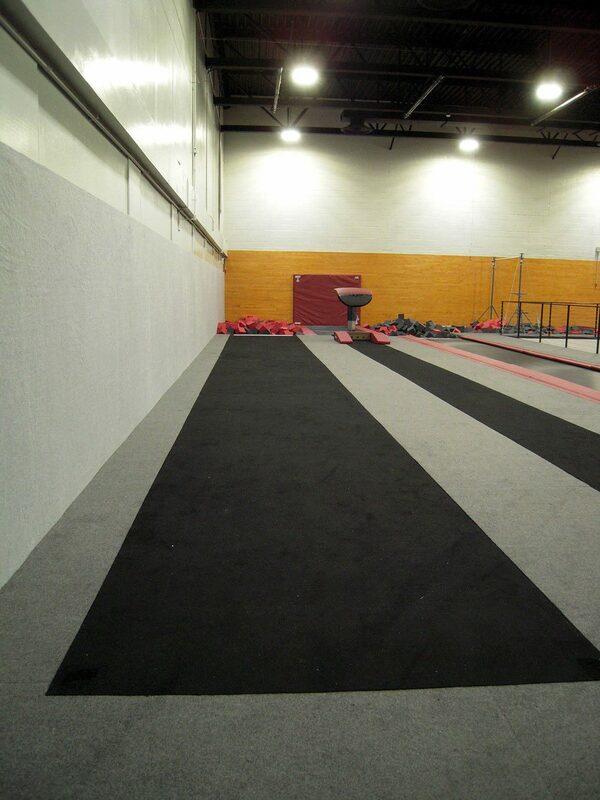 The tumbling strip is covered in 2″ EVA (high bounce) carpet bonded foam. The entire tumbling strip is recessed into the deck of the platform making it completely flush with the padded training area around it. In the left picture is the unfinished uneven bar pit. At the far end of the pit are the 6 steel posts that attach the bar cables to the structural concrete in the floor. The right picture shows the finished bar area. With our signature installation method, the base of the uneven bars is cut into the carpet bonded foam completely hidden from view. Also the steel posts that the bar cables attach to are cut into the carpet bonded foam, hiding them from view. 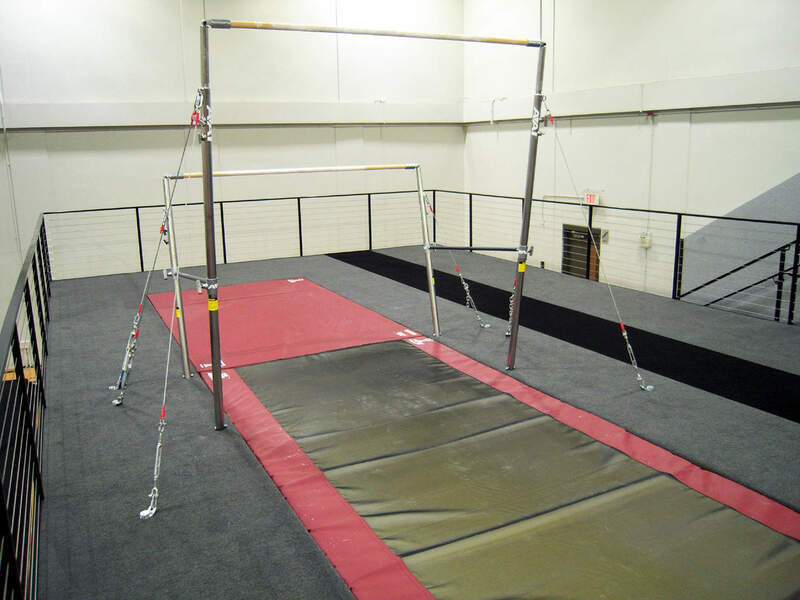 We are the only company that offers this high degree of installation with uneven bars. The picture to the left shows the recessed 40′ Tumbl Trak. The pads attach with Velcro to the surrounding deck padding creating an extremely safe and clean training area. 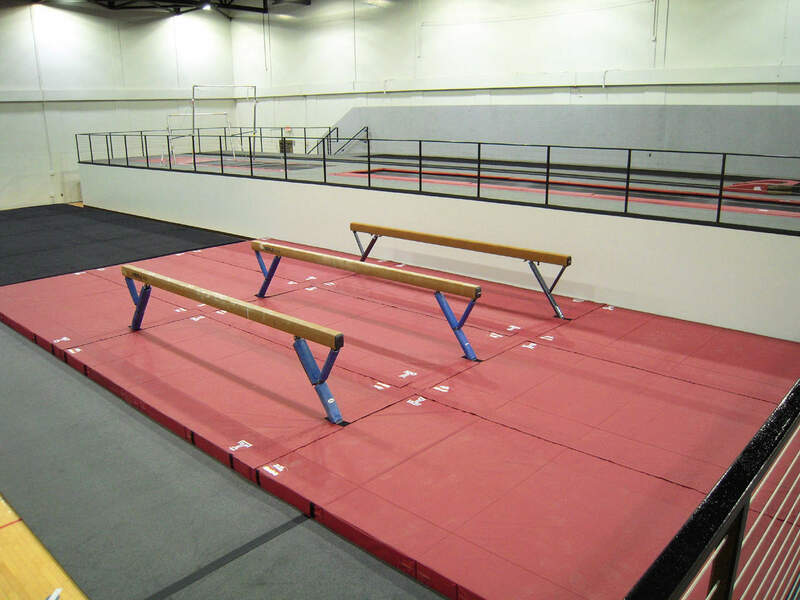 Just beyond the Tumbl Track, are both the vault table and the tumbling strip. We ran light grey carpet bonded foam along the wall the entire length of the platform for added safety and a clean appearance. The main pit consists of two areas. 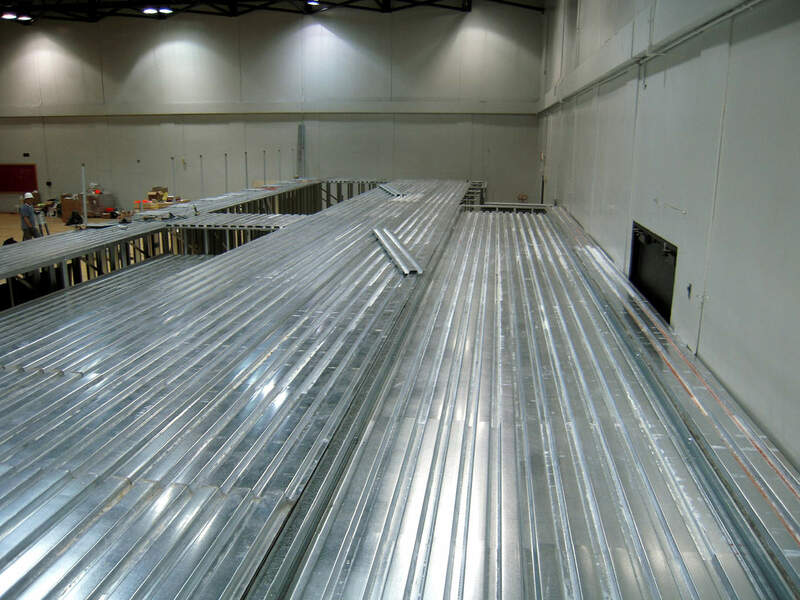 The vault table which goes into an 18′ long resi pit. 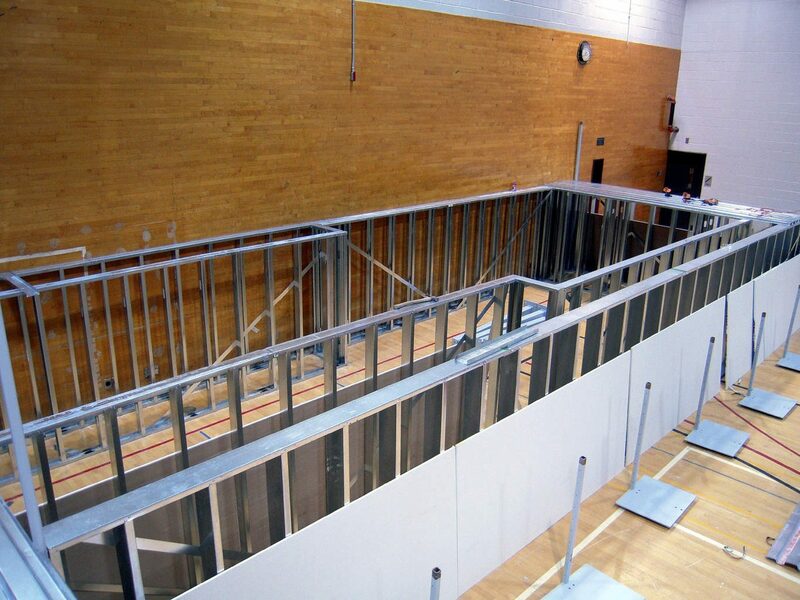 The back wall has a 6″ thick wall pad for added safety for the athletes. 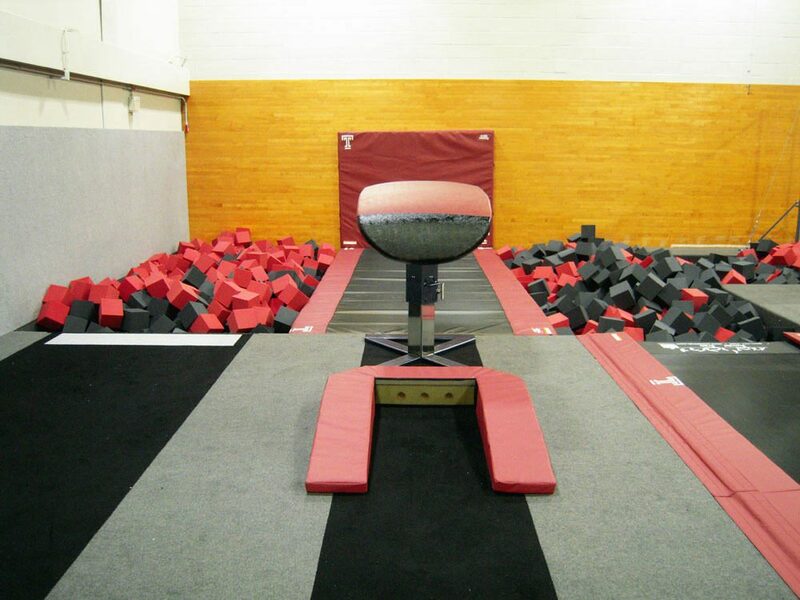 The tumbling strip and Tumbl Trak both enter into a deep foam pit. 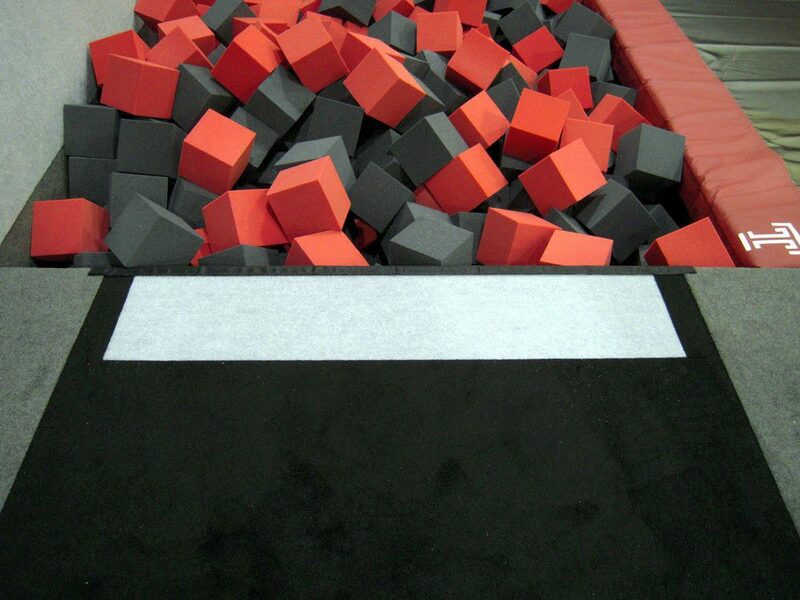 We covered the bottom of the deep foam pits with 8″ thick matting to ensure athlete safety, preventing them from being able to hit the basketball court below. The end of the tumbling strip also incorporates one of our unique design elements. We cut in a light grey section to designate the end of the tumbling strip which adds both a unique look as well as added safety for the athletes while they are tumbling. Looking back towards the stairs, this picture shows how clean the flush training area truly is. There are no mats or pads that can create trip hazards. Additionally, with the landing mats for the bars recessed into the platform, rolling an ankle on the edge of the mats is eliminated. 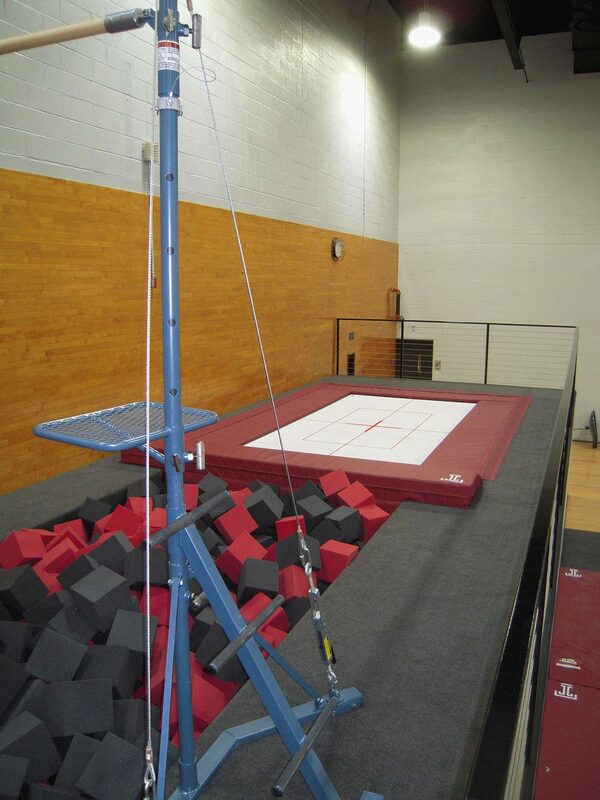 To the right side of the Tumbl Trak is the single rail and 7x14 Ross Trampoline. Both enter into a deep foam pit. The U-base single rail bar is cleanly cut into the carpet bonded foam floor padding. The main pads of the trampoline are flush with the CBF padding and attach with Velcro, just like the Tumbl Trak. 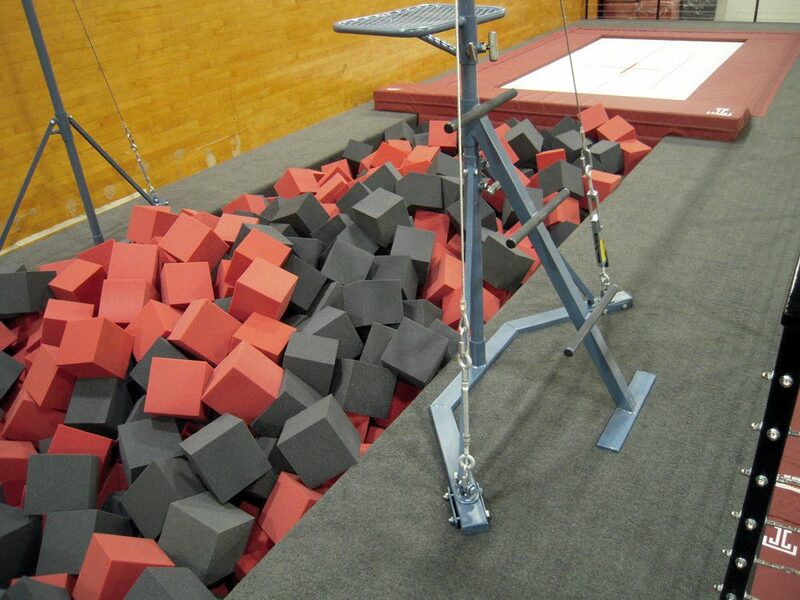 The trampoline features a custom made 8″ thick angled pad that protects athletes when flipping into the deep foam pit. If one lands short, they cannot hit the steel of the wall or trampoline frame. 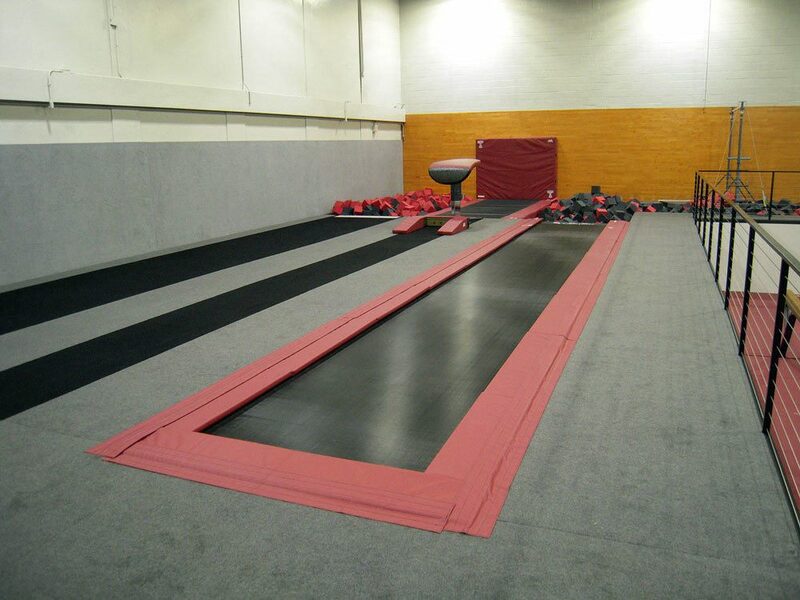 Looking back into the gym from the trampoline area, this picture shows the three balance beams with their custom matting. 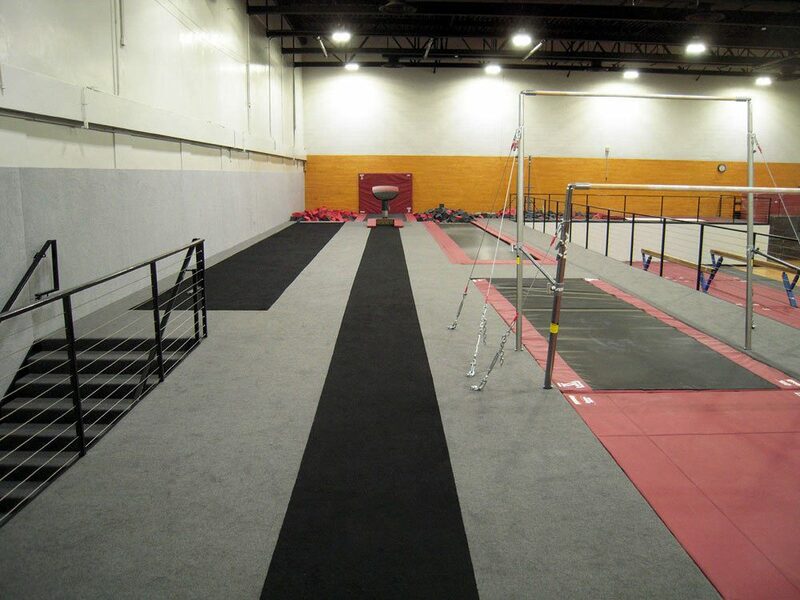 Notice how all the mats Velcro together creating a seamless training surface for the athletes. Additionally, all the matting has Temple Logos on them for that added custom look. 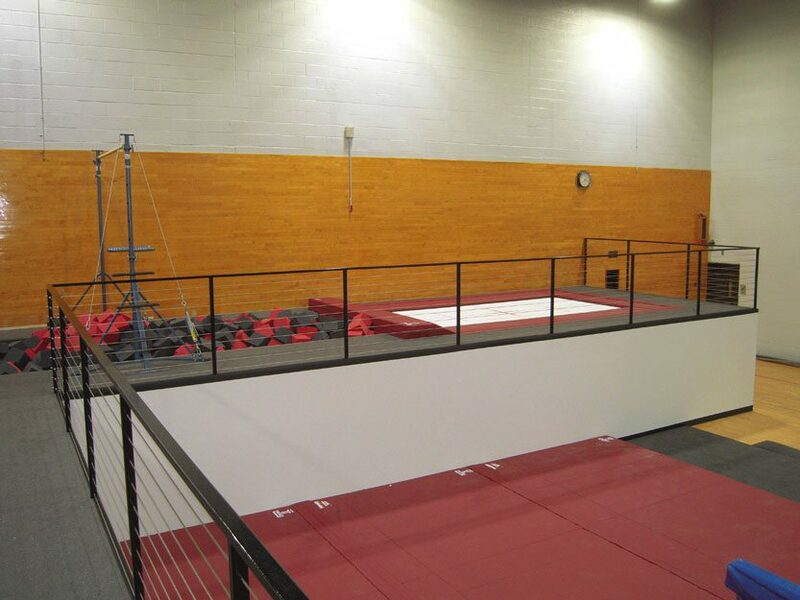 The stainless steel cable railing makes it extremely easy for coaches to see through them, allowing coaches to instruct any athlete from anywhere in the gym with an unobstructed view. This is one of our unique design elements. 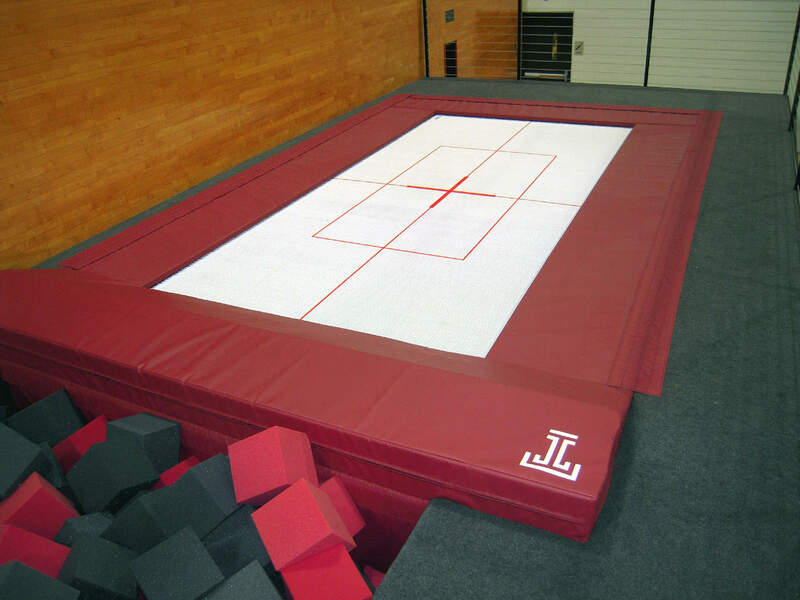 The Temple University Women’s Gymnastics team contracted US Gym Products to complete a new gym design, taking their program to a whole new level. US Gym Products was to design a new training facility for the women’s team within an existing basketball gym. Copyright usgymproducts.com 2018Web Design by Woodchuck Arts in Grand Rapids, Michigan.